Water science is continually moving forward at a faster and faster pace these days. With population growth and the end of easy, cheap water the need to understand our water usage and how to reduce it is becoming a daily news and discussion item. 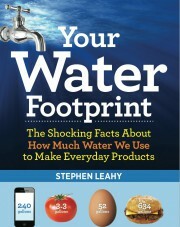 Your Water Footprint – The Shocking Facts About How Much Water We Use to Make Everyday Products by Stephen Leahy is a great example of a book that is shining the light on the impact we are having on the world’s limited fresh water supply. New phases are now entering our lexicon – like water footprint, virtual water, direct water use, indirect water use, gross water use, embodied water, blue water, green water, and sustainable water use are all relatively new concepts and/or terms. The science behind some of these terms is still emerging in some cases, but this fascinating book takes a stab at the current science. Covering topics concerning how much water the everyday items we consume take to produce both in direct water use and in embodied water use. For example, per the book, a 17 ounce bottle of Cola contains a little less than 17 fluid ounces of water, but consumes 42 gallons (163 liters) to produce the flavorings in the bottle of Cola plus 3 gallons (11.5 liters) of water to manufacturer and transport – for a whooping total of 46 gallons (175 liters) of water embodied in one 17 ounce (500 milliliter) bottle of Cola! •Which is better cloth or paper napkins? •What uses less water cloth or a disposal diaper? •What fruit consumes the most water to produce? •Is it better to drink coffee, tea or a softdrink for my caffeine fix? •Which has less of a water impact a cotton or a poly tshirt? •Beef, pork, lamb or chicken? These and many other answers on our water consumption pour forth in this entertaining and extremely well illustrated book. I highly recommend this book. It is a perfect read for those that are fascinated by our impact on the planet, water folks that want to stay abreast of the emerging science on our virtual water use, or anyone else that wants to understand where we are headed as a society in regards to water.